Tino's Fruit Stand started really far from where it ended up. My original core idea (which I will probably do some day) was making interactive multiplayer trading in an online game work. By work, I mean accomplishing the goal of transferring the social aspect of a Monopoly or Settlers of Catan, all the players sitting together at a table, chatting with the person next to you. Taking away the face-to-face communication really changes the feeling of the game. Having a chat box just doesn't do it. So I came up with a mechanic that I thought could bring us closer to the social interaction that is the key addictiveness and fun quality of those games. So I had a core idea for a client/server Multiplayer game with an emphasis on trading resources. I spent a week looking at the casual games out there. I sketched out screens for the game. I brainstormed core game ideas and questions: Fog of War? How to resolve conflicts? How do I make the player feel invested? Always let the player always back out a move unless they commit. Lots of ideas were being thrown around. I played M.U.L.E. (shipped in the 1980s) to better understand the essence of what many people think is the best multiplayer game ever. I was ready to put the bits in motion. I downloaded the PopCap framework for evaluation, and then I talked to Marc LeBlanc, the Chief Overengineering Officer at Mind Control Software, and friend from the Looking Glass days. MCS had an engine for casual games that I could evaluate. Marc was the main force behind Oasis, the Indie Game Festival 2004 Game of the Year. I knew Marc very well, as I'm faculty on a workshop he runs at the Game Developer Conference. I thought I would start by researching their engine, Orbital. The board was going to be resources (like Settlers of Catan) that you collect and could trade with other players. Since I didn't have an artist, I created the color cubes you see in figure 1. I thought getting a grid of colors and a character you moved around would be the first step. I spent one day reviewing the source code for their engine and their sample game, Gem River (a 2006 IGF entry). Then I started ripping out their code and putting in my code to create this grid of colors. By Friday of that week, I had a character (which turned out to be an arrow) that could navigate a grid and eat the color Pac-Man style. It was strangely fun and I thought there was an idea there. In the mean time on the design front, I considered making the "resources" be candy types with patrons such as the Easter Bunny and Santa Claus demanding certain combinations of candy types. I was also considering something I read on the PopCap developer forum boards. One of their leads made the comment that PopCap was not interested in multiplayer games because of the extra support and development costs unless it was an exceptional game. I wasn't foolish enough to think that I was likely to make an exceptional game with my first game. Having run an online game, I understood the headaches of maintaining a 24/7 service, afraid that your beeper would go off at any point and require a drive to the co-location site. So I removed the idea of trading and competing with other players. It would be a battle against the clock. So I came up with ColorCart, as see in figure 1. 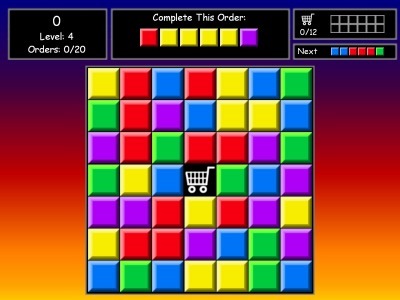 You pick up cubes as you move your shopping cart. There are four orders on the left which need to be filled. They each have a different value that decreases as you make a move. The clock for each order decreases as you move. When a clock runs to zero, the order is missed. As you can see at the top, the goal is to complete the orders needed before you fill up your missed orders. There was a significant strategic element that did not carry over to Tino's. You needed to decide which orders were worth filling and which orders needed to be sacrificed. In this version, the orders did NOT ship automatically. When they were filled, they would light up "Ready" and you needed to click on them to ship them. This way you could let a small finished order miss so you could get a larger order that was worth more. Players thought they had to get the color cubes in order. This problem still exists in Tino's. Players thought the top order was the most important, as opposed to there being no priority. Players did not know they had to click when an order was filled. They didn't understand why it wasn't automatic. 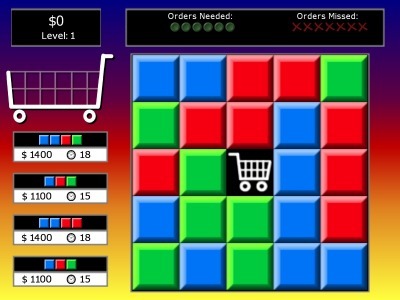 When multiple orders were ready, a player would click on one order which caused those cubes to be used which may make another order that was ready become not ready. This was confusing. Players were confused with the countdown. They weren't sure if it was time based or move based. You don't see this in the screen shot, but as you picked up squares, new colors would appear after a few moves. This confused people because I would have a smaller version of the color to come in to forecast what color was coming in, but people thought they could pick it up. Marc provided invaluable feedback during this process. I showed him the game so he could see what I did with his engine. Marc suggested making orders auto-ship when they are complete. If there was a conflict, then the top most should ship. He then made the comment "I would steer towards you never have to click on an order except as an 'optimization'". This simple remark helped my development as a casual game developer. I should make things as automatic as possible. The user interface should be invisible. You can have "optimizations" but the core game should be straight forward. With Marc's insight, ColorCart evolved into Figure 2. There would be only one order to fill at a time and there would be a "look ahead" order. And I think this is where I introduced the exciting combo bonus that would occur if you filled two orders at the same time. If you look at Figure 2, you can basically see that this is the essence of Tino's. The next four months would be putting in a bunch of bells and whistles, real artwork, a thematic story, and a whole lot of polish. But the core of Tino's Fruit Stand was there. So with this version, I felt ready to show the game to some casual game distributors and publishers to gauge interest. I had a good friend with a leading casual game developer/publisher, so I thought I would get his feedback. I sent him a copy and I waited. And I waited. And I waited. After a week, I sent a follow-up. And I waited. After about 8 days, I gave up and decided to send it to developer relations at three publishers. I wanted to give my friend first crack, but I didn't hear from him. So for the month of November, I felt stalled. I made no progress on the game. I had heard that the publisher would have lots of feedback and change the game. I heard back from two publishers right away. One was Big Fish Games and they were really interested in the game. Another publisher said they were interested in distributing it. I had enough money to finish the game, so I was angling for the best back-end deal and that's what I would suggest to any other casual game developer: make sure you know what you are looking for before you start talking to any business partner. As a side note, it turns out that my friend never got the game. The original email was lost some how, but he did get my follow-ups. But my spam filter ate his responses to my follow-up. I fished them out of the spam folder weeks later but by that time he went on vacation. So I was excited. I knew that Tino's would make it to the virtual store shelves. I just needed to finish the game. Near the end of November, I thought of converting the colors to fruits. I was sticking with the shopping motif. So how did Rikki come about? I was talking to Sam Yeates, a very talented artist, who I worked with at Ion Storm. I told him about this casual game I was working on and the new motif of fruit. Without seeing the game or reading my art list, Sam came up with Figure 3 and Rikki was born. I hadn't thought of a monkey instead of a shopping cart. And over the course of the project, Sam's art would continue to shape the design in so many ways. 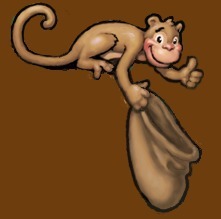 He was the one who coined the phrase, "Rikki the fruit gathering monkey" simply by putting it in the title screen art. The month of December was getting Sam's art in. I didn't have any time to put any new features in. In ColorCart, the board size would stay the same and I would resize the color cubes to fit the board. But when I put in the fruit, the resized fruit did not look good. So I made the size of the fruit fixed. In hindsight, I should have considered how this decision would affect the public's perception of the game. 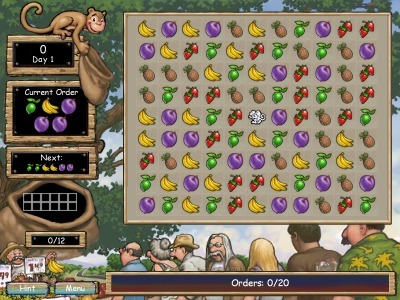 Tino's is not a match-3 but choosing the size of fruit that I did made it look like a match-3 which would confuse many people who saw the screenshots. Those who were expecting it would be disappointing. Those who don't like match-3 would stay away. Again, in hindsight, I might have rotated the board 45 degrees kind of like Magic Match, just so that it didn't look like a match-3. If you look at figure 2 versus figure 4, the underlying game code is pretty much identical. I just moved things around and put in new art. But you can see the difference real art makes. The finishing process took another two months. Finishing a game is the hard part of game development. As experienced game developers know, there are millions of ideas out there. The real work is the implementation. I'll describe the genesis of a few of the last features. The "Picky Order" - After playing Big Kahuna Reef, I wondered why I enjoyed it the most out of all the match-3 games. And I realized it was because it gave me context to which match-3 I cared about. There was an overarching strategy as to where to implement the local strategy of match-3. The goal in BKR is to do a match-3 on every board square. So doing a match-3 in the same location over and over doesn't get you anywhere. And I realized they made the "local" game easier by putting less "color types" on the board which made emphasize the game being about the overall board "cleanup". So I wanted something that made you care which fruit you picked and I came up with the Picky Order fruit. This customer wants that particular fruit. So you better move Rikki over there by the time the order comes up. The "Swing" - my father had suggested a swing that had teleport powers. When you ran into it, you could swing to any square. But that would require a user interface element that I didn't want to add. Right now, Rikki moves in four directions. That's it. It would translate over to a cell phone very well and I wanted to keep the interface as straight forward as possible. But I morphed my father's idea into two static locations on the board you could swing across. And in my final days of tuning, some boards were too hard and I would add a swing from one end to the other and the board became fun instead of frustrating. Crates - when I made the decision to keep the fruit size the same. I was worried about filling up the game screen with enough board on the earlier levels. I was trying to stay in fiction. As you can see in figure 6, there are holes in the board and there are crates. I thought having empty fruit crates instead of a bunch of open holes would fit better and make it feel like a blossoming fruit stand. Not sure I accomplished that. But crates had a secondary use. As I was doing the story mode, I realized that I needed to accommodate players that were doing enough to finish the level and those players who got every bonus. I decided that if you got every bonus, then you would get enough to get an improvement to the Fruit Stand per level. But if you didn't, you could repeat the level until you earned enough extra money to get the improvement. But I did not want the level to look the same. As it turns out, I realized I could make the level feel different by simply moving a few crates. The Story. Where did the story come from? Big Fish decided that they wanted to not only distribute the game but to publish it as well. I was impressed with their enthusiasm and I felt that Nate Webb saw why I made this game. I didn't want to make another match-3 but something different. One of their suggestions was incorporating a story mode. I had played many games and seen story modes implemented as a bunch of dots on a map. There was no context to why one dot was more important than the other. I also wanted a way to get a player invested during the 60 minute demo period. What you see in the shipping version is pretty much my first proposal to Big Fish. There would be an introduction as you see the peaceful countryside change with the introduction of a MegaMart shopping center. And Tino would be fighting for his financial life and you would help him save the fruit stand. Sam drew 16 brilliant images that told of the struggles and success of the fruit stand. The original idea was to tie each image to a game change, but I realized that some changes couldn't be visually conveyed very well. What does it mean to increase an order size or customers on the image? How do you do it multiple times? 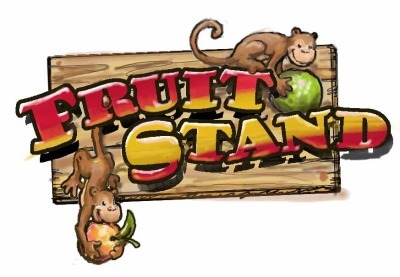 There were some testers who wanted to decide HOW to upgrade the Fruit Stand - more fruit types? More customers? Bigger orders? 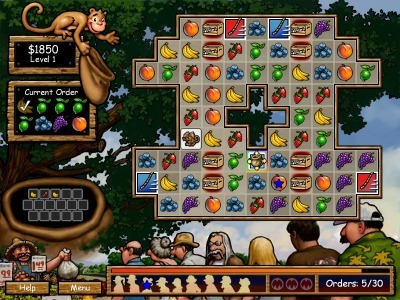 This would have made the game less casual - though I now believe some player choice would have caused more player investment in the Fruit Stand and game. Polishing touches. In the last two months, I looked for easy ways to increase the polish factor. I added Rikki putting the fruit in the bag as you pick it up. Testers noticed this right away. Another nice touch is that if you don't interact with the game for 30 seconds, Rikki goes to sleep and starts snoring. I believe it's important to have small touches like that as long as they don't take too much time. Just putting in the music was a huge improvement to the gaming experience, though I know a few friends said as long as they could turn it off they were happy. Figure 6: Tino's Fruit Stand. Complete after 151 days of development. Postscript. Tino's Fruit Stand is Chasing Dogs first title. It's months after the release. I've seen it on a lot of sites. Big Fish Games has done a great job getting it to the other portals. But I'm still not done. I'm wanting to get to the next project, some pieces of which I've hinted to in this post-mortem. But I needed to learn Flash and get a Flash version done. Here it is on Big Fish's portal. I thought it would be good to learn Flash on my own instead of getting someone else to do it. That took a week to learn and program from scratch. Now I'm on to localized versions of Tino's. And now I'm writing this article. Like I said before, finishing a game is the hard part. Just when you think it's done, it's not. Thanks for your time in reading this. I hope you enjoy Tino's Fruit Stand.